I’ve stated multiple times, both on and off line, that I enjoyed Pirates of the Caribbean: Curse of the Black Pearl more than I thought I would on really any level. A movie based on a Disneyland ride like that should not have been any good. The performances of all involved (OK, most involved) really raised the level of quality an incredible amount. They brought to their thinly written characters a sense of life and fun that made the movie not only watchable but downright enjoyable. That being said, I have my concerns about a sequel. It seems to me that the first movie caught lightening in a bottle to some extent and I’m really worried they won’t be able to do so twice. Yes, the cast is back but that mean the movie will be as good? Not necessarily. And will Johnny Depp’s vamping as Captain Jack hold up? Since his performance is what most of the first movie rested on that’s the real question. If that is unsustainable the movie as a whole will suffer. So much of the success of this second movie relies on Jack Sparrow not turning into James Bond, escaping from one impossible situation after another until our suspension of disbelief is completely shot to hell. So let’s take a look at how Disney is selling this second entry in the franchise. Actually, from what I’ve seen, there’s only been one original poster created for the movie. 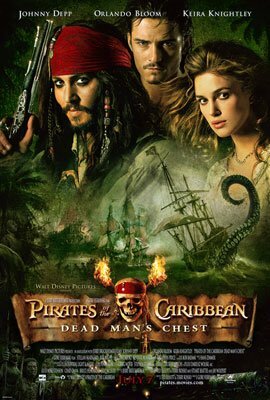 That one-sheet is of the big-floating head variety, showing Depp, Orlando Bloom and the lovely Kiera Knightly. Everyone looks like they’re back in character and having fun. The rest of the poster looks, well, it looks like a pirate movie. It has a cool green jungle look that, based on the trailers, seems to tip the locations of the action pretty well. That poster was recycled as a Netflix envelope ad. The actor’s heads were also broken out into individual posters. The same title treatment and overall look was maintained, it’s just that instead of having all three faces on one poster they had all that real estate to themselves. The teaser trailer isn’t really a teaser in that it doesn’t really hide anything. It shows brief glimpses of some new stuff, like a couple of weird fish-headed characters, but other than that it’s more an initial trailer than an actual teaser. 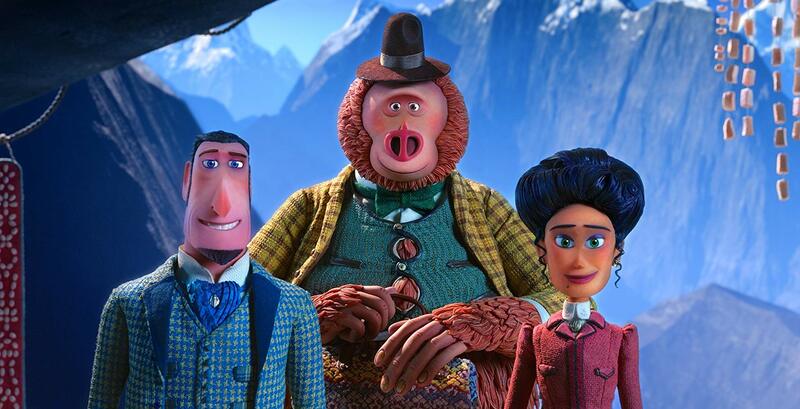 What it is is exciting and has a great sense of the same fun and adventure the first movie had. Unfortunately there’s very little of Kiera Knightly in it but other than that this was a solid first effort for the movie. The full trailer is more undeniably cool. You get the sense from it that the movie isn’t made up of action set pieces but is one big long set piece with a bit of plot along for the ride. There’s more plot in this one, something that was only hinted at in the teaser. Jack Sparrow owes Davy Jones (not the Monkee) his soul and is on the run from him and his enforcers. It’s clear from this one that Jack is as unrepentant as ever and that Will Turner and Elizabeth are still along for the ride. Good stuff that works well at building anticipation for the movie. The overall look and feel to the official website was, I thought, amazingly similar to that of the site for Chronicles of Narnia: The Lion, the Witch and the Wardrobe. You scroll through different environments and find different content. Along the way you can click on little trinkets in each scene to get things like bookmarks (the real kind to use in books, not for your internet browser) and other download-y type stuff. Unfortunately the content itself is not as original as the design. You get all the usual stuff with very little deviation. Perhaps the biggest of the cross-promotions for the movie was The Hunt, a contest sponsored by Volvo. A Volvo SUV was buried somewhere and people were told they could go search for it. In order to get started the searcher had to visit a Volvo dealership to get a map and start accumulating clues. That, as both Mack and I said, was a pretty blatant attempt to get foot traffic into the dealerships. My favorite part of Mack’s write up of the promotion was that he speculated it wouldn’t be long before someone posted the clues online and the community came together to figure out where the car was buried. Volvo must have been really excited about the deal since they launched a blog (which for some reason was hosted on MSN Spaces â€“ I don’t get that) and also issued a number of press releases naming the all-time greatest pirates and other things. They were trying a little too hard if you ask me. That partnership between Disney, or the movie and Volvo over a year ago when it was announced there would be a Pirates of the Caribbean-branded boat in the Volvo Ocean Race. As I said that was over a year ago and was one of the first bits of news about the movie we had heard. Remember that the movies are based on a ride at the Disney theme parks. So these rides would naturally be part of the marketing push, right? The studio/company figured that out and actually modified the ride a bit to be more in line with the movie. Reportedly the changes weren’t dramatic and stayed true to the spirit of the decades old ride, which is good since a drastic change to a much-beloved attraction could have engendered some ill-will in the customer base. Kodak stepped up to the plate in a couple of ways. Free tickets to the movie were included in packages of Kodak film for one thing. They also hosted a contest encouraging people to submit their pictures (preferably, I would guess, those taken with a Kodak) of treasures, either literal or personal and sentimental. Verizon also helped Disney out with a variety of mobile offerings for subscribers to their V-Cast service. Users could access mobile games, ringtones and other videos like trailers and cast interviews. They also have a text-message based choose-your-own-adventure game where each text you send is an entry in a sweepstakes. The prize for said sweepstakes is a trip to the world premiere of Pirates of the Caribbean 3. Nice to see they’re thinking ahead on this. There were also a number of branded items released, such as M&M’s , cereal and more. U2 frontman Bono and others even got together to record a bunch of pirate-themed songs. Yeah, I’m scratching my head too. the Starz movie channel is pimping the movie on July 6th with an airing of Depp’s movie Finding Neverland as well as a behind-the-scenes look at the new flick. What was most surprising for me to read was that there were no branded items or other promotional things created for the first movie, making this the first time you could buy Pirates of the Caribbean toys and other swag. That really took me back and made me wonder why. Did Disney not think the movie would be a success and so didn’t bother? Or did they not think the slightly more adult nature of the movie lent itself to kid’s toys? For Disney not to create as many promotional items as it possibly could is a bit of a shock and there has to be a reason. Disney never sits out efforts like this completely. Never. Seriously, never. So why? Like just about every other major movie of the last six months, Disney used MySpace for part of the marketing effort. They didn’t, though, create a profile page but instead created a contest for MySpace users. The interesting thing, though, is that MySpace went out of its way to accommodate Disney. They went so far as to create a kind of â€œsafe zoneâ€ for Disney to live in. This allowed Disney to tap into the power (I’m not sure what that power is yet, but whatever) of the MySpace community without sullying its hands by actually joining the community. A family friendly company like Disney simply couldn’t be seen putting itself out there with something that’s been so often reported as being a haven for sexual predators and minors acting older than they are. Kind of like their theme parks, Disney prefers to keep the real world out and operate in a carefully controlled environment. A lot of this movie is going to sell itself and Disney kind of went overboard (sorry) for the marketing push. I’m not saying it was bad but that the original movie had a lot of word-of-mouth going for it and that’s a big part of what made it a success. I don’t know what it is, but there’s something about this campaign that’s putting me off. (I’m a fantastic writer, aren’t I?) It seems like the studio is just trying too hard. It feels like they’re taking a car that’s cruising along at 55 MPH and are trying to push it to 75 when it was going just fine on its own. The campaign is strong. The trailers and posters are all very good and the website is good if not great. They certainly don’t lack for corporate partners but I’m wondering if this is as effective as they might think it is at raising awareness and interest. But there’s that extra piston that’s missing from the push. It almost seems like this movie is succumbing to the corporate blandness – at least the campaign is – that the first movie was able to avoid because of its lack of hitting over the head-ness. Still a good push that makes me excited to see the movie, so in the end it gets a favorable grade from me. Just seems like a case of the whole being less than a sum of its parts. I am also ambivalent about the “Pirates 2” marketing push. With the first movie, we could like it for any number of reasons. “Pirates 2” is to be enjoyed by Kodak users, Volvo users, McDonald’s users, etc. 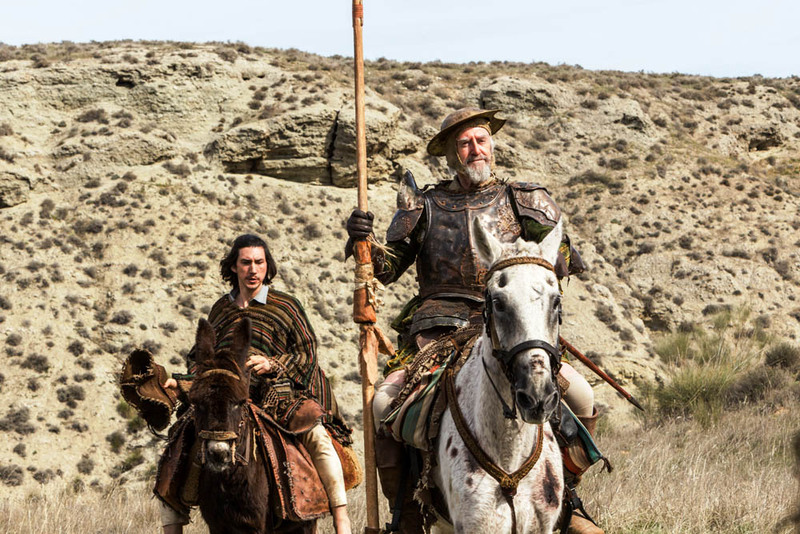 There are some negative side effects of brand extension, and the sequel in relation to the not-so-brand-extended original film makes for an interesting test case of those negatives.